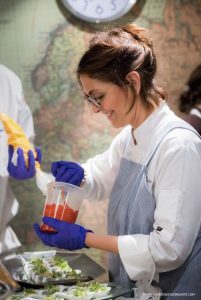 The invitation involved cooking for the “Aegean Secrets” event on March 13, 2018. 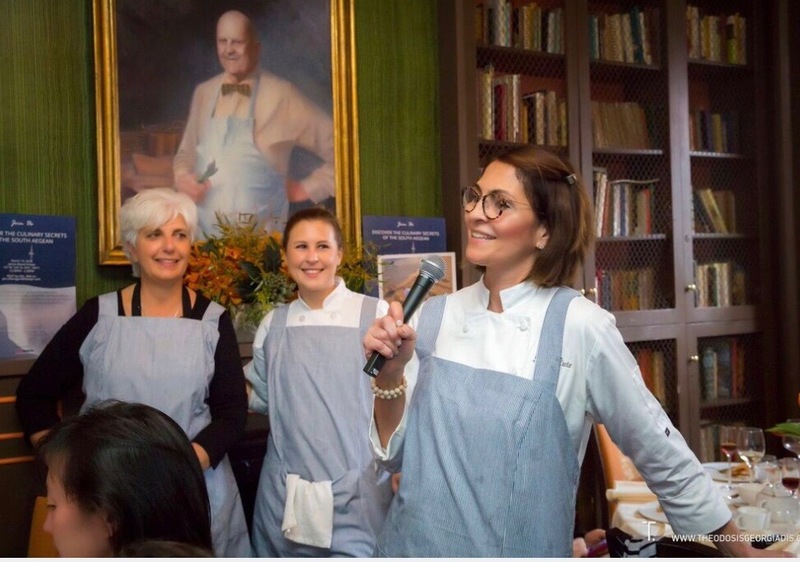 It was led and orchestrated by the “First Lady of Greek Cuisine,” Chef Argiro Barbarigou of the Papadakis Restaurant in Athens, Greece. 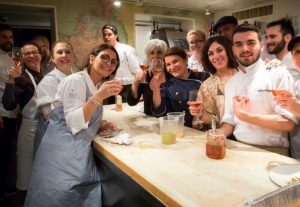 The culinary team for the events included representatives from three chapters of Les Dames – South Florida, New York and California – along with a number of Greek chefs and other Greek representatives who accompanied Chef Argiro from Athens. When I arrived in NYC on March 9, I was ready for an adventure, armed with – among other things – a bag full of recently sharpened knives and comfortable chef shoes. I took some hours for myself – as any creative person should – to find inspiration at the Museum of Modern Art. 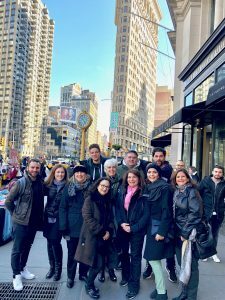 By Saturday, when I met the Greek team at our hotel in the Flatiron District, I was overflowing with energy and enthusiasm. On Monday morning, we were guests on a Hellas FM radio show. Next, we toured the James Beard House. Most of Monday afternoon was consumed with preparations for Tuesday’s meals, but our group worked together seamlessly and the prep work, while extensive, came together beautifully. We felt like the Greek-American dream team! We arrived at the James Beard House on Tuesday morning at 8 am, excited to start on the luncheon. To mark the event, each of us was gifted a personalized blue and white apron made by a Greek designer. 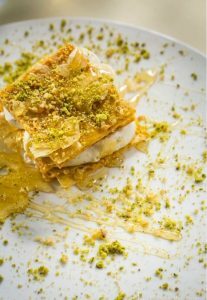 All of the cooking ingredients came from Greece, including Aegean saffron, fouskoti (traditional Greek bread), creamy yogurt and feta, caper leaves and edible flowers. My personal favorite was the thyme honey, from the Greek Isles. Lunch was a huge success! We took a quick break at 3 pm and then started on preparations for the dinner event. Together, we made Ntomatosalata (a delicious, fresh, tomato salad), Octopus Styfado, a Greek fisherman’s soup called “Kakavia,” garnished with vegetables and edible flowers, “Revythada,” a slow-cooked chickpea stew with shrimp, a Greek-style Lamb Fricassee and Giouvetsi Brousko (Greek-style veal cheeks), finishing off the evening with a decadent baklava for dessert. 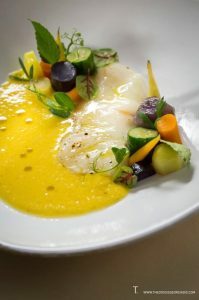 Meals were served in the dining room where James Beard once slept, his portrait watching over us with approval. Although we didn’t exit the James Beard House until well after 11 pm, it was one of my most memorable, rewarding days! The smells of the kitchen, including the slow-braised veal cheeks and lamb fricassee, will stay with me forever, and so will all that I learned from this transformative experience. Chef Argiro is an authentic, wonderful Greek chef and terribly passionate about her food. It was fantastic to watch and learn from her work. She treats her talented team with love and respect, which made all of us feel like more than collaborators – we forged bonds of friendship.